The Carols of Christmas Suite is featured in the upcoming Holiday Catalog, but Stampin' Up! has made it available in a special Early Release so you can get started on your Christmas Cards early! Today, I'm sharing a couple of cards I created. First up, the card I thought of first with this set. The trees, the sky, the snow. 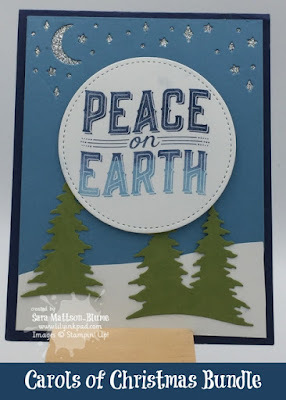 To make the Peace on Earth, we sponged Night of Navy and Marina Mist onto the stamp and then stamped. The Old Olive trees have a little sparkle from a brushing of Wink of Stella. The snow was hand cut and the sentiment was cut using the Big Shot with the largest circle from Stitched Framelits. To make the moon and stars glitzy, I added a strip of Silver Glimmer Paper. 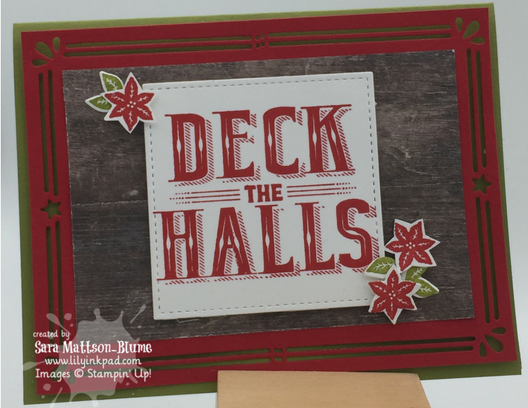 My next two cards use classic Christmas colors. I love this one for it's traditional Northwoods feel. I cut out the frame and added a piece of Wood Textures Designer Series paper for the background. Deck the Halls looks pretty good in Real Red, right? I added the Poinsettias and I was done. A cute, easy, and great looking card! 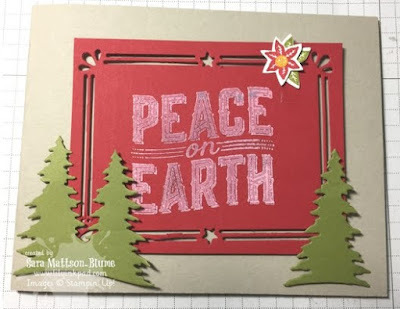 I used Whisper White Craft Ink and clear embossing powder on Real Red. If you are observant, you've noticed that the frame is smaller than the other one. I have a quick video to show to how to place the frame on the paper to achieve this. The other little detail to point out, is the center of the poinsettia. I added a Glitter Enamel Dot in Crushed Curry. Those little enamel dots can be used on any card!